Like they say not all that glitters is gold. A few days back, Herbert was busy kissing his beau's behind like there was no tomorrow, but now, their house is on fire and looking at how fast things are unfolding, they could even divorce. 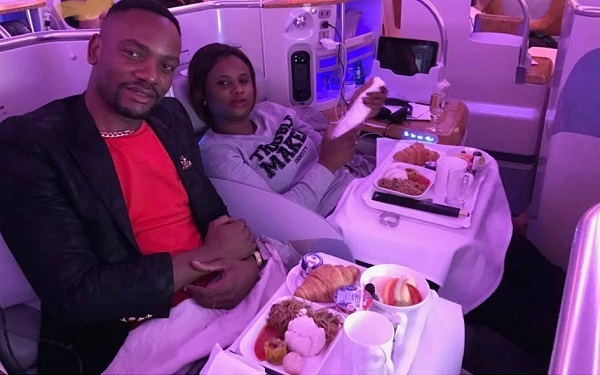 Fast rewind, Herbert and Dorothy held a luxurious wedding in December 2016 just days after the SK Mbuga wedding that was characterized by pomp and glam. Herbert and Dorothy have been managing Kampala based Space Lounge bar jointly, and as you will read in the rant, it turns out that Dorothy has been financing literally everything. The trouble stems from the PR that Herbert hired to run things, she turned out to be his girlfriend. Soon or later, Dorothy learnt of this and very quickly swung into action and fired, Sheilah. "I'm here by dismissing Sheilah, the Space Lounge PR with immediate effect, she will be replaced by Rachael." On the eve of their anniversary, Herbert took to Facebook live to wish his beautiful wife a happy first anniversary, but the Will Smith look-a-like guy just got served hot soop right in his face. "Which sort of man are you bringing private matters on Facebook. I made you what you are and It's high time people know exactly who you are. I made the money you pose with while in Zambia. The machines that I bought for Shonga Advertisment, you have sold all of them. I paid over USD 6000 to repair the Mercedes car that you got an accident with." "I was managing that Club and things were moving well until you and your family members asked me to keep out claiming that a husband does not work with the wife and then, you went on to hire Sheila. We have fought before because of Sheilah, past 2am you are in touch with her, you gave her a job in the very club I invested my money." I pay house rentals, pay school fees and you are here bouncing using my money. "My wife is someone who likes partying and the best way I could make her happy was to buy her a hangout place of her own,"